Many people ask one of these 2 questions because they don’t understand some of the basics of SEO. The first question that needs to be ask is what are they searching for that their websites isn’t showing up in Google or one of the other search engines. A lot of times website owners “assume” that just because they now have a website and it is on a specific subject or topic that it should immediate show up in the search engines. They go to Google and search for “XYZ widgets”, the topic of their website, and they don’t see it and assume that it can’t be found or it just isn’t showing up. 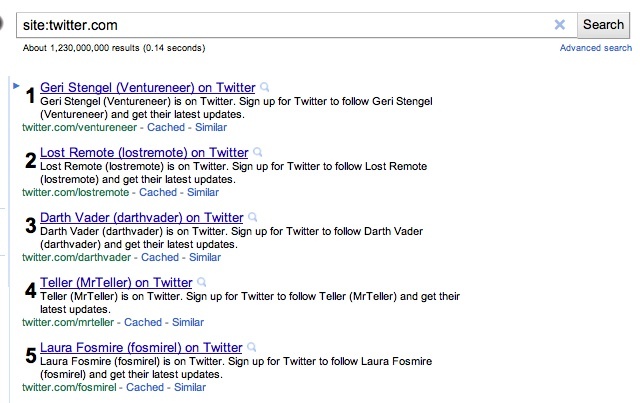 This will show you if Google has your site in their index. Notice right below the search box there is a line that says “About 1,230,000,000 results”. That means that Google has index around 1.23 billion pages from Twitter.com. The search engine’s index is their catalog of the pages they’ve crawled on a particular site. Crawling and indexing are the first steps to getting your website to rank. Once the search engines have your site in their index, the search engine can then run the pages through their algorithms to determine where they rank amongst all the other pages on the internet that are similar. As long as the number that Google displays is 1 or more, then Google has found your website! Now, that only answers half of the problem because you’re probably more interest in why your site doesn’t show up for the general phrases or keywords that the website is about. This is a little more complicated to diagnose right out of the gate because there are a lot of factors that go into this like the content of your website, the number of links and the quality of those links that are pointing to your website and all the other SEO basics. Two easy ways to find out if your website is ranking for more general phrases would be to either using a ranking program or checking your analytics. A simple ranking program is called Rank Checker by SEOBook.com. Its a Firefox plugin that allows you to put keywords into it and run them to see if your website is found. If it finds your website ranking for a particular keyword or phrase, it tells you the position of that ranking. The key here is that you need to know they keywords that your website is ranking for, or the keywords that you’re targeting. Analytics is a better way to see what your website is ranking for. Most hosting providers give free stats with your hosting service. The stats would either be AWStats or Webalizer. These stats programs will give you a very basic look into what people have found your website by. There is a keywords or a search engine section that shows you the referring keyword terms. Another analytics program that you can get for free is Google Analytics. Google Analytics is a little more robust feature wise that the other 2 programs and can be installed fairly easily. These 2 things should show you if your website is showing up for general keywords and phrase. If not, go back to the basics with creating unique content and building links to your website.